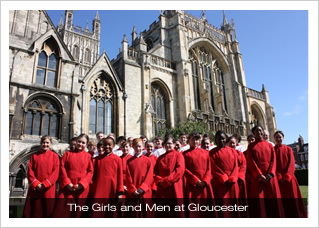 Today the choir of Girls and Men (36 in all) visited Gloucester Cathedral for the first time. We were warmly welcomed by two of the Virgers, Nick and Dickon, who led us through a remarkably chaotic Nave (full of remarkable activities celebrating the Mothers’ Union Day of Prayer for Africa) into the calm environs of our wood panelled rehearsal space. After an hour of rehearsal, we dispersed to investigate the City, and find luncheon (and the Lay Clerks their obligatory liquid sustenance). We returned, robed and rehearsed in the glorious acoustics of the Cathedral itself. Our programme was a display of all things North American (when we sing as a Visiting Choir, we like to take unusual things, rather than things that the congregation will have heard their “house” choir sing already) – Jack Ossewaarde’s ‘Draw us in the Spirit’s tether’ (with shades of Vaughan Williams), Craig Phillips’ accompanied Responses for St George’s Church, Roswell, New Mexico, the Psalm to a chant by Bruce Neswick, the Canticles to a setting for St Peter’s Church, Amarillo, Texas, by David Ashley White, and the spine-tingling anthem ‘O nata lux’ by Morten Lauridsen. After a short break we assembled for the service, and were welcomed by the Canon Pastor, The Reverend Canon Celia Thomson, who contributed some excellent, carefully prepared, and wonderfully paced Intercessions during the service. If it were ever in doubt, we knew that we had Mr David Bednall as our accompanist as soon as the voluntary hit – Howells’ Psalm-Prelude set two, number three – Sing unto the Lord a new song (how appropriate!). We were thus propelled back into the real world. After the service Canon Thomson kindly invited us back, and we quickly arranged another visit to sing a prestigious Sunday Choral Evensong ‘slot’ – 14 October 2012. We offer thanks to Canon Thomson, the Virgers, and all in the Music & Liturgy department for making our visit such a success. If you missed it – there is a chance to hear the Girls and Men sing the same programme, this time at St Paul’s Cathedral in London – Monday 5 September at 5:00pm.